Edgar was told plain and simple: if I make 100G/day, you can't make 5K/day. Clear logic, right? Stormcloak of Korgath sent me a strange conversation. I'm not sure what the moron's problem was, but his insult is at least innovative. The second post shows someone being way too determined to get low lvl greens for DE. Brian wrote: "This guy routinely buys me out to try to reset the price, not realizing the immense amount of inventory I'm sitting on. My new game is trying to figure out the optimal number/price at which he'll buy me out, reset the price, and instantly be deeply undercut again. That buyout point is higher than I would have expected, and rises in inverse proportion to the number I list. " What can I add? "Dear beloved, we gathered here today to laugh on Catheroes who thought monopolizing an obviously mass-produced item is a good idea"
That linen cape... that has GOT to be a typing error. He hit numbers and didn't realize he hit enter, or something... that's just so weird. Do people even think at all before they spew bs and hit enter? Sometimes, I honestly think that cataloging the social nature of mmo players is more torture than anything else. What is achieved by deep undercutting? I never really knew and I'm curious. What is the benefit of deep undercutting? "What is the benefit of deep undercutting?" Sales, and the potential for decreased competition. I can tell you that after only reading here for a short time. Many sellers will usually do one of two things: buy you out to repost, or decline posting a day or two "while the price comes back up". Meanwhile, the lower priced items sell like proverbial hotcakes. Honoured to provide the amusement. "What is achieved by deep undercutting?" As Role Craft said, you can save time and still make good profit if you have no serious competition. That mr. Arctic Fur remark reminds me of a free lesson on how to AH I stumbled upon a while ago. Racism in the first example is *fun*. Do you even read these things before you post them? You and Edgar should be ashamed of yourselves. deep undercutting works when the current price is actually too high to clear the market, which happens often. If the current price *is* market clearing or below, then it would better to undercut 1c or even overcut (ie. list at a fair price and assume that the people under you will sell out, I do this with infinite dust -- of course I also buy out all the lower if there's enough difference to make a profit reselling for the market clearing price after fees and a small risk adjustment). The trick is that in a market for a crafted item where the materials are very plentiful, the market clearing price is basically wherever the profit becomes low enough that only enough sellers to meet demand stay in the market. I it goes high enough to draw another seller, supply exceeds demand and price goes down again. And of course, because you can produce as many as you want as long as there are herbs, inks or pigments on the ah, even one or two determined sellers can produce a huge supply. 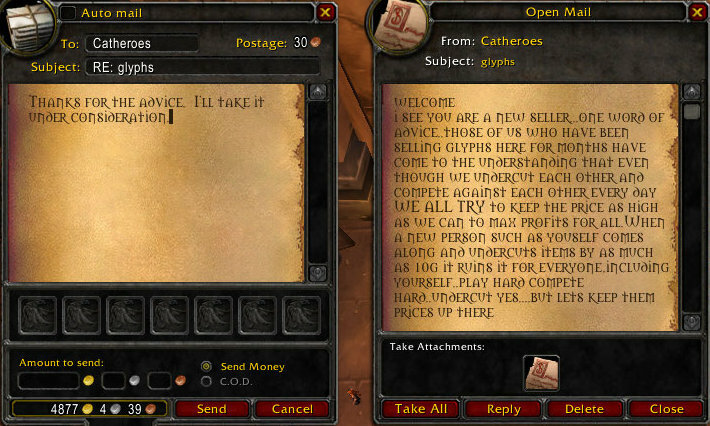 Since any given glyph will never sell fast enough at any price to move the herb market, the market clearing price is always going to be fairly low (at most 5-10g above the mat cost, and more usually only 2-4g profit), unless you have no active automated gevlon style scribes making that glyph. Even when you are the only major seller, moving the profit margin too high will lose some sales as people decide to go without. More importantly, as glyph demand is fairly inelastic before prices are skyhigh, it will invite other glyph makers to compete with you. 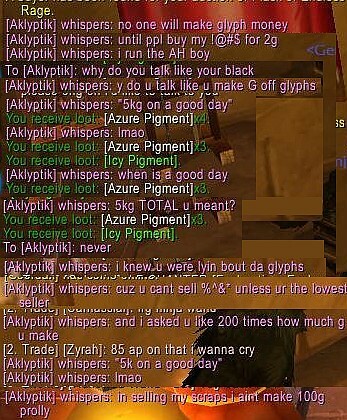 If you are making 20-30g per glyph, someone who is not particularly automated can make good g/hr selling at those prices, so they will want to compete. If you are only making 5-6g profit per glyph, only another gevlon style operation will find that worth competing for. But if you are that style of operation, 5-6g per glyph, or even 2-3g per glyph is enough to make some pretty solid profits. I make very solid profits trading enchant mats and my typical profit threshold per item is around 50s. that's a lot faster than crafting glyphs, so I wouldn't make a glyph operation to make 50s a piece, but at 2-3g it's going to rival my trading threshold for g/hr, and at 5-6g it will probably rival my average in terms of g/hr. *That's* why you deep undercut in the glyph market. But note that deep undercutting in gathered material markets is generally a big mistake (it's only correct when you know the price is wrong and too many people will farm their own or wait out the market). And it's a mistake that I, as a trader, profit from all the time. Xaxziminrax: I agree, a current bid of 68g, if it wasn't a stupid typing error, would imply that *two* people thought it was worth 68g. I think somebody had started to bid 68g on some other item, didn't, and then clicked bid on the cape without realizing they were about to bid a ridiculous amount. "I run the AH boy"
It never gets old to watch someone make that impotent claim. Translated, what they are saying is "please, I beg you, don't crush me like a bug." @Brian, the guy who went deep undercutting instead of keeping prices high. You may be making decent amount of gold, but have you actually TRIED going along with their plan of keeping the prices high? I wouldn't be at all surprised if you actually make more money just playing along with their "cartel", while spending less time replenishing glyph stocks, unless there is already another goblin in the glyph market. But the way he puts it, there doesn't seem to be another goblin yet, only you. I can assure you the linen cape was an outbid. I bid it up to the same as all the others. I try to pick up random level greens to DE. Why? It's far easier to pay some gold to make profit than try to run say stockades for 10-15 greens. I find it amazing how many items I can actually win that way. Nothing makes me happier buying greens cheaply and doubling or tripling my profit. On a good day I can even find level 40 to 59 greens selling for 1g to 2g, Hello 2 essences. Easy way to turn 2g into 30g. As for the Mr. Arctic Fur comment. Apparently someone has noticed me picking up Furs cheaply when they got down around 60g-80g I would buy the whole market out (all of them listed on the Auction House). Yes, I would have to spend 10k to do it but I would then raise the price back up to say 100g each and list 5 to 10 at a time. Then people would start jacking the price up in return. Little did they know I had a huge bulk sitting in the bank I could continue to sell at 100g-110g while they were trying to charge 130g each. Sadly this is coming to an end with the next patch since they will be vendor bought also. This means I still have 35 furs to move in the next couple of weeks.